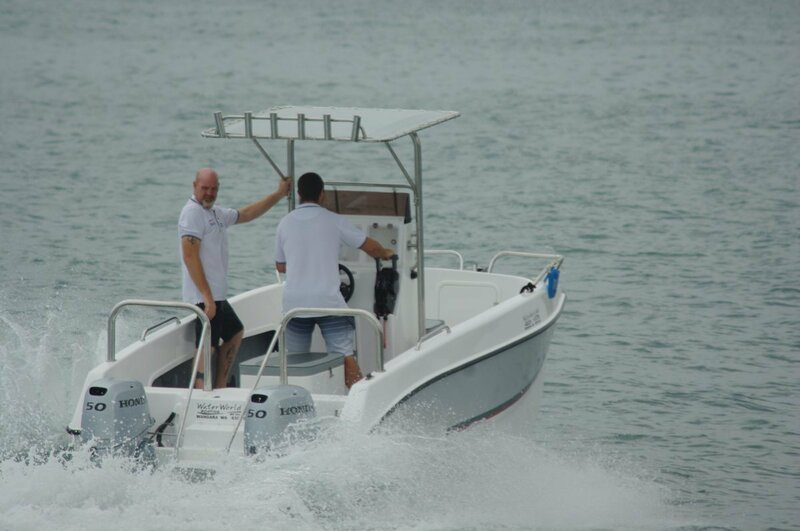 The 520 is the smallest in the Seacat family imported from South Africa but, in the way of cats, still has the characteristics of a larger boat. The price though, especially for a twin engined boat, is modest: $49,900. For the money you get a complete package. The builders designed the boat for fishing, and they equipped it for the job. Two large catch tanks, a live bait tank with viewing window, a bank of tackle drawers, rocket launchers in the T-top and rod racks within the bulwarks. Not equipment, but definitely part of the fishing package, is the stability. The beam is an unexceptional 2.2 metres but the sensation it gives is of something half a metre wider. Three people, which is probably the comfortable complement of anglers, can move around or stand in a cluster without causing appreciable movement of the hull. Bulwarks are carried higher than on most self draining boats; this is achieved by a lower than usual deck. To prevent inflow of water through the transom drains caged balls rise and fall with waves, alternately closing and opening the drains. The hull came out of a complex mould and is a symphony of curves, which are not there for decoration; the 520 handles the sea very well indeed. Certainly it pitches in a head sea but the movement is nicely damped. The vertical acceleration is modified by the shape of the bows and further cushioned by the air trapped in the tunnel. The review boat was powered by a pair of 50hp Hondas and their combined output felt about right. With three weighty people on board acceleration was effortless as was cruising in the mid 20s of knots. It was a pleasant boat to drive, not heeling the wrong way in turns like an older generation of cats. I often see people with twin outboard powered cats manoeuvring their boats alongside using differential power as though they had inboards with fixed shafts. I find this futile; it is more effective to drive as though there were just one motor on the back. Using this technique, the 520 handled responsively and precisely. The console is carried high, topped by a small windscreen. It was not called on to stop spray but looked strong enough to handle a solid wave. The extra height is used to incorporate clear fronted lockers for vulnerable items. These lockers also give access to the huge wing nuts securing the T-top’s legs; lowering to reduce drag when towing is the work of seconds. Centre consoles are not noted for storage, but the 520 does a good job. The console is a little wider than average and its volume is increased by the seat moulded into its front face. It adds up to respectable space. A locker under the foredeck is probably even bigger, and a pair of transom lockers add their volume – although most of it is taken up by the twin batteries. The large seat aft of the console houses the fuel tanks: four portable tanks adding up to 100 litres. Alternatively they could be rehoused in the kill tanks, freeing up enough space for more gear than most people own. Boats in the Seacat’s home country are beach launched into surf and, inevitably, strike trouble from time to time. The visible evidence for this is the crash bars for the motors and the stainless strips protecting the keels. Invisible is the extra strength built into the fully foam filled hull. Hull weight of 600kg is a little higher than expected for a boat of this size. The complete trailing package is also heavier at 1300kg. Still light enough for a medium car to tow, but given weight by the massively strong trailer. This is another nation of origin feature, designed to absorb brutal treatment on Durban’s beaches.